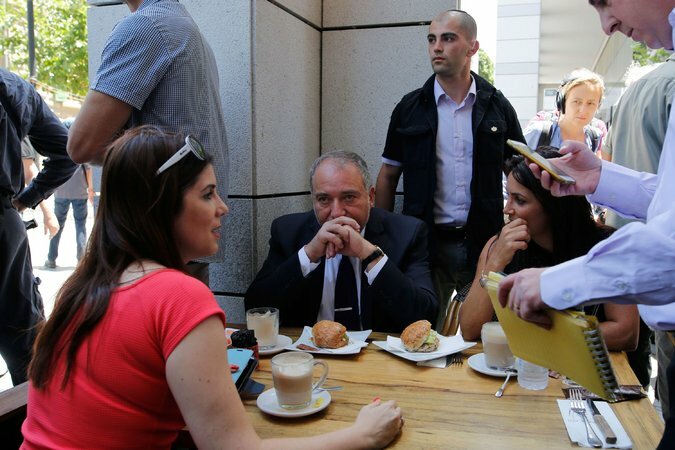 TEL AVIV — Israel’s new defense minister, the avowed hard-liner Avigdor Lieberman, drank a cappuccino Thursday at the popular restaurant where two Palestinian gunmen in black suits and ties had killed four Israeli civilians the night before. These expressions of solidarity from across Israel’s political spectrum unfolded as the government canceled the work permits of 200 of the attackers’ relatives, closed off the West Bank village where they live and canceled more than 80,000 permits for Palestinians to enter Israel during the holy month of Ramadan. Indeed, in the aftermath of the killings, Israelis seemed determined to show resolve and demonstrate a swift return to routine. Shocked waiters and cooks in striped pants hugged each other while diners ate on the Max Brenner patio. On a patch of lawn opposite, dozens of youths from a pre-army leadership course sat in a circle and sang peace songs. After an eight-month wave of Palestinian attacks that have killed about 30 Israelis and two American visitors — and that had seemed to be ebbing — the killings represent a first test for Mr. Lieberman as defense minister. But despite years of tough rhetoric about how he would counter terrorism, he seemed to have recognized the limits of power. Even after dozens of stabbings, car rammings and shooting attacks in Jerusalem, the West Bank and cities around Israel, the assault on Wednesday evening was particularly brazen. It took place in the shadow of Israel’s military and Defense Ministry headquarters, across the road from Sarona. 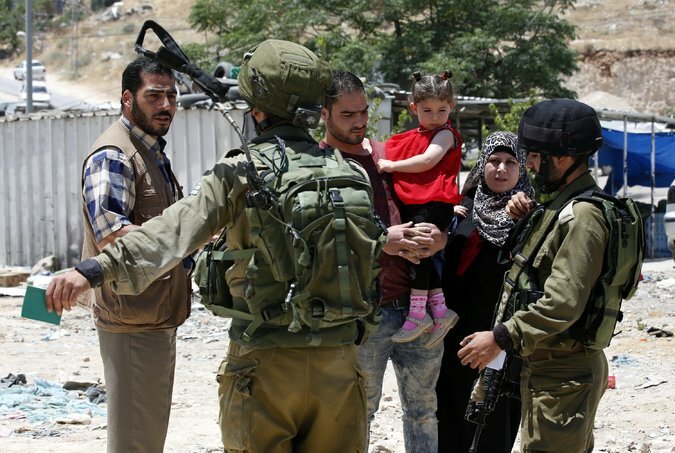 The Israeli military authorities responded on Thursday by temporarily suspending the special travel permits granted to West Bank Palestinians for family visits to Israel during the Muslim holy month of Ramadan. They also suspended permits for Palestinians from Gaza to travel to Jerusalem for prayers at Al Aqsa Mosque. In the West Bank, Palestinians responded to travel restrictions put in place by Israel after a deadly attack in Tel Aviv. The authorities said they had revoked 204 work permits held by relatives of the gunmen, who are cousins. The military sent two battalions of soldiers to bolster its forces in the West Bank, and said the Palestinian town where the gunmen lived, Yatta, in the southern West Bank, had been sealed off. 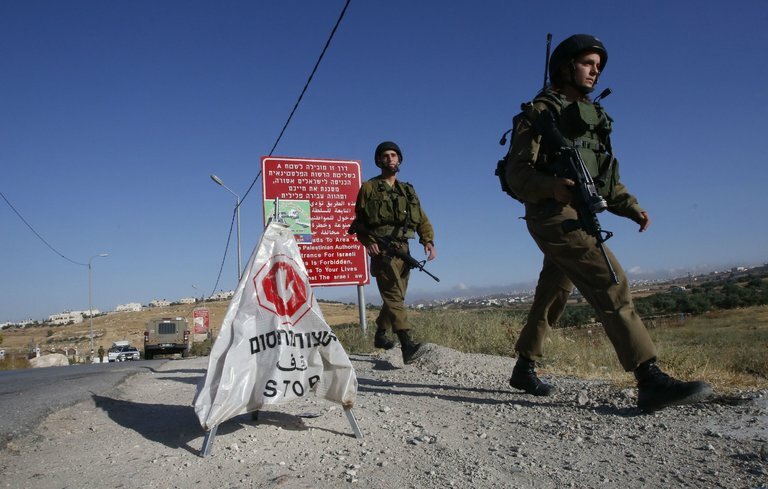 Still later, the Israeli authorities closed off all routes to the West Bank and Gaza Strip until Sunday, with exceptions for medical and prayer visits. This is often done over a long holiday weekend, but the attack gave it added significance. The Palestinians and human rights groups have denounced such measures, and the demolition of the family homes of assailants, another frequent Israeli tactic, as collective punishment that only encourages more violence. Mr. Lieberman has, in the past, demanded much harsher measures, including the death penalty, for Palestinians convicted of terrorism. Many analysts had predicted that Mr. Lieberman, a former foreign minister and leader of the ultranationalist Yisrael Beiteinu party, would be more pragmatic as defense minister. There was no mention of the death penalty after the security cabinet meeting. Ahmad Mussa Mahmara, the father of one of the gunmen, who were equipped with crude rifles, was quoted by The Associated Press as saying that he was surprised by his son’s act. “We didn’t expect this,” Mr. Mahmara was quoted as saying. “My son is young and has been in Jordan for the past four years, and just came here for the past five months. He does not have any political affiliation.” Some other Palestinians celebrated the killings, according to reports. The four victims were identified as Ido Ben Ari, 42, whose wife was wounded in the assault; Ilana Naveh, 39, a mother of four daughters;Michael Feige, 58, a sociologist and anthropologist at Ben-Gurion University; and Mila Mishayev, a woman in her early 30s who friends said had been engaged to be married. Prime Minister Benjamin Netanyahu of Israel said another person had been arrested following a deadly shooting in Tel Aviv, and he described other security measures put in place. Dr. Feige was a noted scholar of Israeli society, according to a Ben-Gurion University statement. His book, “Settling in the Hearts: Jewish Fundamentalism in the Occupied Territories” won a prize from the Association for Israel Studies in 2010. Four people remained hospitalized in a Tel Aviv hospital. One of the gunmen was being treated in the same hospital for gunshot wounds from a security guard and the other was in custody, according to the police. Tal Sharabi, 22, a waiter at Benedict, where some victims had been sitting, said he witnessed the shooting. “They killed people who, a moment earlier, I had been asking if the food was tasty and if everything was O.K.,” he said. Besides politicians, some residents of this coastal city came to Max Brenner and Benedict to express solidarity. “The one thing that does not affect us is fear,” said Yoni Itzhak, 36, the chief executive of Operativa, a Tel Aviv consultancy, as he sipped an espresso milkshake. “So suddenly everybody is together, we are all one people!” one man said to a friend as they walked passed the politicians, the rabbis and the singing youths. Details emerged on Thursday of a bungled response to the attack that left many Israelis incredulous. One gunman, who had discarded his weapon, fled to a nearby residential building, asked an off-duty police officer for water and was taken into the officer’s apartment for refuge, according to the police. Only after the officer went outside to help with the pursuit of the assailants did he realize that the man he had left upstairs with his wife and her mother was dressed in the same attire as the gunman who had been wounded. He returned to his apartment with backup and overpowered the fugitive.